When I read 'The surprise of a winter radish' by Emily Horton at The Washington Post Food section on Wednesday I felt antsy. I couldn't wait for Sunday to arrive to make my excursion into the farmers market in DC for this elusive, new to me radish. All week I fantasized about....black radish! On Sunday, a few lbs of assorted radishes later, I put a question on twitter asking for recipes and cooking suggestions. 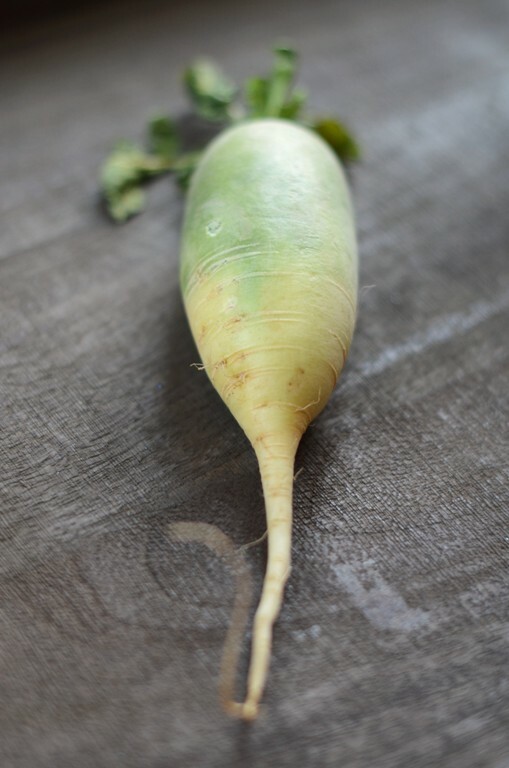 On any given day we eat the regular ole' radish raw, this weekend's crop had more of a bite to it, more pungent. Reminiscent of sinus clearing horseradish at the Passover table. 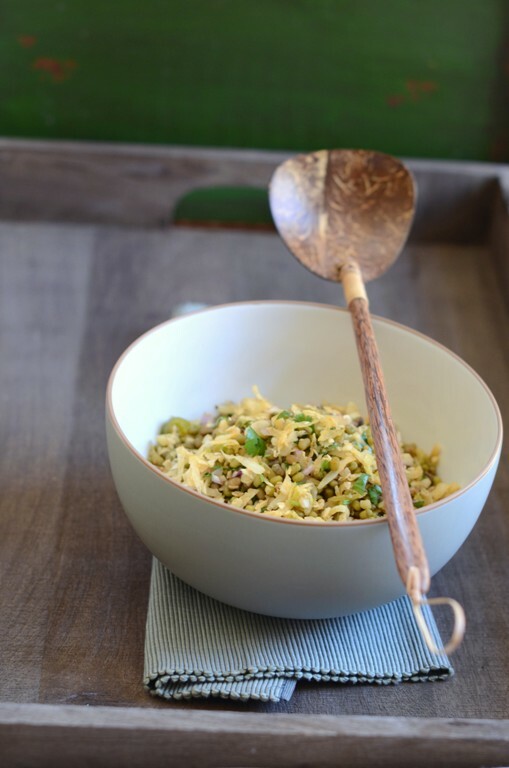 Kathy (@kathygori) of the wonderful site The Colors of Indian Cooking came to the rescue and this recipe was inspired by her 'Radish Slaw Salad'. Cooking the radish gives it a sweeter, milder flavor. I shredded the radishes and tossed them in a wok. The consistency of the shredded radishes was so similar to the shredded coconut flakes that the ingredients played off of each other. A guessing game of sorts in your palette. In this recipe I incorporated a couple different radishes as you can see from the photos. I found the green to be stronger in flavor. Both were sensational!! I always like to have a legume or bean salad prepared ahead for midweek lunches. The beauty of these super healthy salads is that they keep well for a few days. On medium heat warm up 2 tablespoons oil in wok or a heavy Saute pan. Toss in the hot green pepper, cook for couple of minutes till soft. Add mustard and cumin seeds, they will sizzle as you add them, cook for few seconds and then add the coconut flakes. Cook for couple seconds longer and add the shredded radishes and salt for taste. Cook while mixing for a few minutes until al dente. Remove into a large bowl, add the lemon juice and mix. In a deep pan add mung beans, cover two inches above beans with water, bring to a boil, reduce to simmer and cook until very soft but still retain their shape. Drain well. 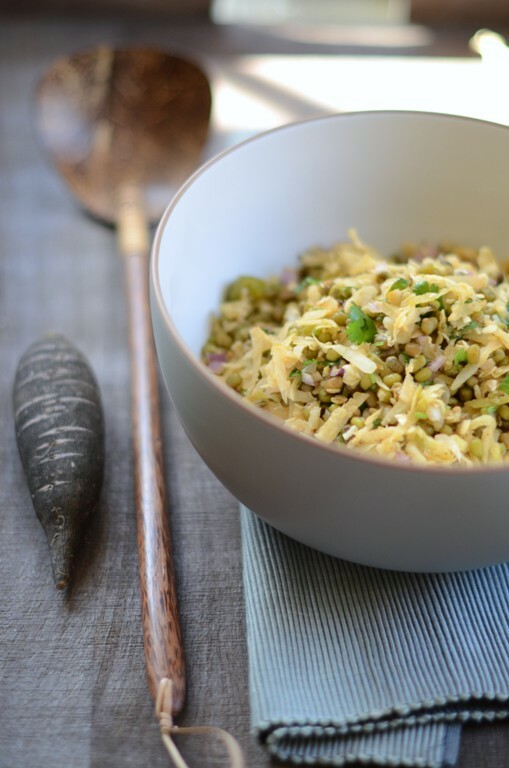 In the same wok that you cooked the shredded radishes in, add 1-2 tablespoons oil, toss in quickly the garam masala and quickly add the mung beans. Add salt to taste and cook for a few minutes while mixing until mixture is completely dry. Add mung beans to cooked radish. Add red onion, cilantro, adjust for salt and mix. Enjoy!! Cook's note: Variation on mustard, cumin seeds, cilantro and garam masala measurements is based on your taste!! A wonderful salad! What a flavorful combination. Just the kind of dish I love. Such a wonderful salad idea, and love your photos too Shulie! My radish repertoire is rather small so I'm happy to be introduced to the black and green versions here, as well as a new recipe. Would never have thought to put together something like this but I like the sound of it. I need to get back on a healthy track after vacation. This is just the ticket. Thanks, Shulie! Oh, and I love the second image of the radishes! Black Radish! I always knew black was beautiful, but never knew radishes could be black too. Love your photographs Shulie and a really lovely recipe. Love the use of moong bean with.radish. Beautiful pictures, as well. Well adapted Shulie! I can totally imagine moong bean complimenting the radish. Your pictures are great as usual. Beautiful! I never buy any radishes other than the tiny red ones we get here that are mild enough to eat raw with just bread and butter. I never thought to wok one to make it milder and sweeter. Wonderful recipe, Shulie, beautiful photos! I've never seen black radishes in the market, but would love to try them. Love your photos! 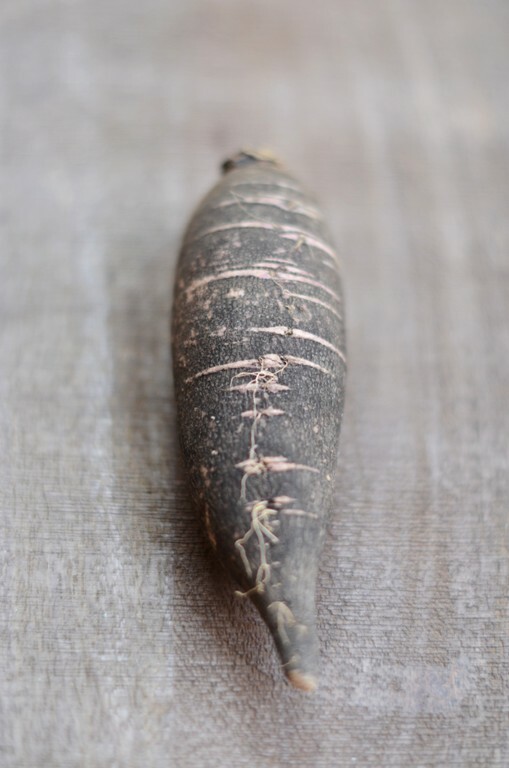 I never saw black radish before and I am so curious to look for it now. The only dish I make with radish is paratha. I should try your recipe next time i buy radish. Just my kind of salad, and I love that it keeps well so I can make it ahead of time. This delicious salad is perfect for my new vegetarian diet! Thanks for sharing Shulie! Only you could make a bean salad look so pretty! Sounds quite amazing, too! Beautiful picture and lovely salad.I did a radish test here some time ago,buying all the available kinds of radishes,and the black one actually was my least favourite.My favourite was the green radish,that is green even inside! Funny you sound much like me. I like them all. The other radish in the post is the green one inside & out. I found it zestier than the black radish but I loved them both and I do like the milder varieties as well. :) I wonder if you cooked with them at all? TY all for comments and dropping by. 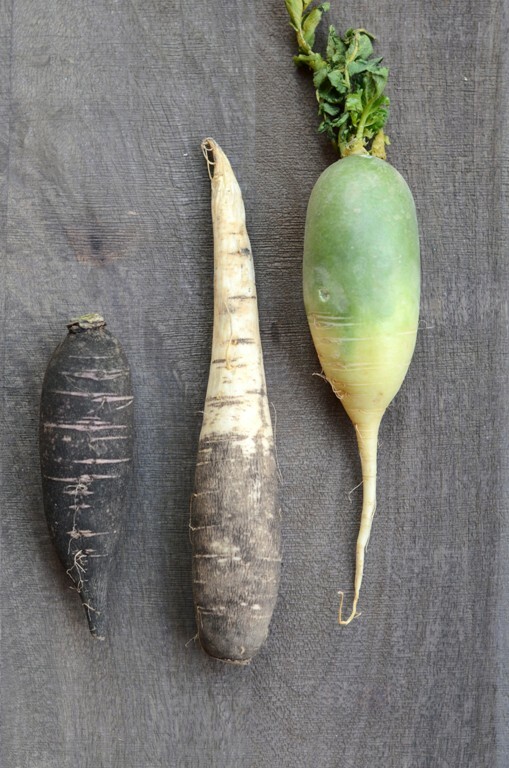 I love new discoveries and for those of you who didn't encounter black radish yet keep a watchful eye at the farmers market. So fun! !